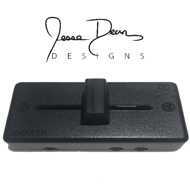 The ultimate portable fader by the mighty Jesse Dean, this fader is ready for both regular and hamster scratchers! -Full size fader cap by Cooler Caps! Comes with custom made box, cables, velco and a sticker! connected last in the chain.